PolicyInteractive is exploring the disconnect between climate science and public policy. The science strongly suggests we are headed for a climate train wreck while effective public policy is stymied by strong actors holding competing interests. The root of the research is the examination of public opinion as a driver of collective actions and effective public policy. This project is Oregon-focused but draws from national and international methods and findings. To minimize survey error based on single issue sensitivity, as well as to obtain opinion results relative to other competing social interests, surveys were designed to place global warming within a subset of other pressing social issues. A range of survey methods are utilized and methods are reviewed by outside experts in survey research. For this project, each individual survey was intended to iteratively inform the next in an exploration of beliefs, aspirations, values and cultural motivations. Five random Oregon-wide surveys were completed and two sets of community members were interviewed to allow for more detailed responses. Our findings to date have caused us to alter course toward a more general exploration of “values” from the original intent to assess public opinions on policy issues. This course correction is reinforced by the current economic downturn occupying a disproportionate amount of policymaker attention – the economy has taken most of the oxygen from climate concern. We recognize that all individualistic or social concern resides in a dynamic mix of concerns and issues, and “climate concern” is only relevant if viewed in the broad range of cultural demands and emotions. Further, we have always assumed that effective long-term policy requires a firm foundation of values and beliefs. Thus, this research utilizes academic and empirical findings in behavior and values from studies and literature. As with other research we track, we continue to affirm and struggle with the difference between aspiration and behavior. Our results uncovered a layer of social commonality we did not expect to find. Early on we found extremely high response agreement to problems of consumption in our culture. We find the issue of consumption as a cultural negative shows strong agreement with both the political right and left, bridging ideological rifts. Because American consumption levels have a strong correlation with emissions, there is potential for positive social change by supplanting some of the dialogue about climate change more toward consumption reduction. Based on outside evidence, we’re not convinced that such dialogue should be carried by the usual suspects. And we don’t believe this can be done through variations of scolding and guilt-laden messages. We believe the research needs to define the positive values and motivations people feel about “why our country would be a better place if we all consumed less.” We therefore believe deeper examination of values and motivations is justified. It is with this objective that we report where we’ve traversed and where we now find ourselves. This opinion survey on climate change and government policy was Oregon-wide, completed in April 08, and allowed us to compare Oregonian’s opinions to national polls, affirming a lack of climate policy support. Among other interesting findings, this survey revealed that Oregonians view climate change less threateningly than the nation as a whole and that 87% of respondents agree “our country would be better off if we all consumed less.” This survey used a select set of values indicators to obtain a more nuanced snapshot of social characterizations typically captured with traditional demographic measures. Demographics showed accurate representation of statewide population for: citizens 18 and older, gender, and geographic representation. This survey on fuel, energy costs, and government policy was limited to Oregon, completed in June 2008 as the price of gas was rising past $3.50 per gallon. The purpose was to put fuel anxiety issues in context with other social concerns, including climate change. This survey revealed Oregonian’s attachment to inexpensive energy, affirmed our earlier “values” findings, and added detail to earlier findings on Oregonian’s views of consumption. Because our advisory members expressed concerns that we might be misjudging how respondents define “consumption,” we embarked on interviewing a selected group of respondents from our first survey. This consumption concern interview focused on respondents who identify with the right-wing ideologically and are unconcerned about climate change. Participants were recruited from Survey #1, and selected for: (a) don’t think climate change is a concern; (b) think environmentalists are extremists; (c) believe “Our country would be a better place if we all consumed less”; (d) chose the statement “This economic downturn may be just what we need to reorder our values” over “This economic downturn means our leaders should do everything necessary to stimulate the economy” and (e) had previously given permission within a random call for a follow-up interview. Respondent file analysis clearly suggested these interviewees fit into the conventional political “conservative” definition. From a pool of 85 respondents, four research-trained interviewers made a total of 34 follow-up interviews to ask these individuals their views on what they meant by “consume less,” if they themselves should consume less and/or how, what values they think need to be reordered, and a cluster of related items about economic, environmental and social policy issues. Responses were recorded and transcribed into a synoptic format. Results showed a surprising degree of social commonality below the conventional ideological veneer. Analysis indicates possible openings to frame consumption (hence GHG emissions) in non-ideologically reactive terms. This study involved an interview process similar to the format described in #3a, but consisted of an Oregonian respondent group of 30 community leaders, cultural “influentials,” or “elites” who typically interact with broad groups of the community. These respondents were selected as likely to have conversations with at least 200 citizens per year on social or policy issues. They were chosen based on how they fit among the cultural sectors of politics, commerce, religion, and academics and across the ideological spectrum. The intent was to compare responses between the elite class and the Oregon-wide representative samples. Findings suggest a comparable concern and level of agreement regarding consumption as seen in Oregon-wide sampling, but with a higher level of stated concern for climate issues and sensitivity to economic security. This opinion survey on government and taxation, revisited some items from earlier surveys and extended our exploration of consumption issues. This survey was completed November 30, 2008. Here we focused on the views of citizens toward government’s role compared to individual roles in addressing consumption, and specifically tested variable responses to fees and taxes in how they addressed consumption. Results once again revealed strong concerns for society and over-consumption. The majority of survey participants showed support for monetary fees to be attached to consumption, showed a lack of confidence in government to handle such fees effectively, and had strong feelings that the taxation system is broken. For example, while 91% agreed that “taxes are necessary to pay for things of the common good,” 68% agreed that “government is wasteful and inefficient and cannot be trusted to make good decisions.” Seventy-seven percent said they would support a consumption tax on luxuries if it were fair to low income people, although because this question is listed late in the survey, the responses may be effected by priming effects. An inserted values question set module from a British research firm (Cultural Dynamics which does values research around the world) showed that Oregonians differ from U.S. citizens by being significantly less acquisitive, more adaptable and more quality-of-life oriented. Results aligned with earlier findings of strong support for “consume less” among citizens who are ideologically conservative and strongly religious. A fifth statewide survey in April 2009 aimed for greater detail in understanding citizen views on consumption costs and fees within the context of the economic downturn. We were interested in looking at opinions on consumption, declining revenue designated to support state and local services, and degrees of willingness to pay higher fees or costs on various forms of consumption. This survey drilled deeper into attitudes on willingness to make individual changes and monetary contributions to support public policies. We were also interested in the deepening economic downturn effect and how responses might compare to earlier reported consumption attitudes. Results revealed continued strong support for ‘consume less,’ which was considerably stronger than agreement response to the need to consume to support the economy. A body of research based on the World Values Survey predicts that economic downturns trigger materialistic tendencies but this was not borne out in these results. It is noteworthy that the first national survey we know of that tested the ‘consume less’ disposition shows results comparable to our four survey responses. This April 2009 survey commissioned by the Center for American Progress found that a ‘consume-less’ item obtained the highest level of common agreement on forty items which they believe define American ideology. Survey 7 on the economy, environment, and public policy was conducted between November 30 and December 10, 2010 with 400 Oregonians age 18 and older. This survey departed from the prior five surveys in that we decided to dig deeper into cultural values as they relate to our research into consumption attitudes. Specifically, this survey covers some cultural issues much more generally and broadly, especially cultural views toward the economy and broad views of our political system. Unlike our earlier surveys, we did not use a values theory question battery, opting instead to free up room for more open-ended responses to certain general questions such as the direction of the country. Another format change from the prior five was a return to a “forced choice” style of question where a respondent is asked to choose between two potentially difficult pathways that define our cultural direction. This question form uses a pair of statements designed to frame oppositional differences that are cultural dilemmas. A refinement on the commonly used forced choice is that we define what we mean when we ask a respondent if they “feel strongly” enough that they would feel moved to take “some action such as speaking out in public, writing a letter to a newspaper, donating money to an organization or being a key reason for voting for an issue or person.” We believe this question form improves the measurement of extremity of viewpoint as a “behavior” indicator compared to what is commonly available through standard measures of level of agreement where acquiescence (tendency to be agreeable) bias is a well-researched weakness in surveying. Consistent with past methodology, this survey questionnaire was peer reviewed and pre-tested to minimize bias or priming. 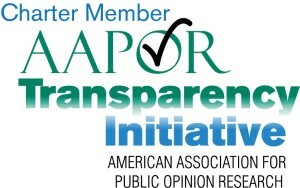 The last question of the survey asked respondents if they had any observations or comments about the survey, about half of the respondents offered input but only four of four hundred offered that the survey seemed prejudiced or biased; two were self-identified conservatives and two were liberal-progressives. PolicyInteractive’s telephone landline sample method recognizes a bias toward older and more conservative respondents. We do not yet consider this a fatal weakness because we prefer a slight slant to conservative views on the environment and public policy, two topics toward which conservatives are commonly seen as unsympathetic. Nonetheless, a follow-up survey of 1200 northwest respondents of our key benchmark items in January of 2011 by DHM Research affirmed the accuracy of our findings, a topic discussed in the Survey 7 briefing paper about citizen dissatisfaction with contemporary pubic policy. Other than being slightly conservative and older age biased, the survey is geographically and gender representative of Oregon citizens eighteen and older. Random sample Oregon-wide surveys are conducted by outside professional contractors following industry standards. Qualitative interviews are conducted by PI staff working from standardized templates. Strong effort is made to construct survey instruments which are ideologically balanced and are peer reviewed by qualified advisors. PowerPoint presentations are shown with the full set of survey questions in the order they were asked, with rotations and n variations noted. Break-out results or consolidated findings expand on the connections between the surveys and outside research. PolicyInteractive adheres to the Code of Professional Ethics and Practices of the American Association for Public Opinion Research.